Did you catch Doug’s interview in March with Jayson Sacco on his podcast Outdoor Adventures with Jayson? Be sure to check it out. They discuss food plotting from beginning to end from the perspective of someone new to the process. Jayson’s podcast episodes cover topics ranging from North American white tail and bear hunting to African safari’s. Learn more about Jayson and subscribe to his podcast on his website. This entry was posted in Uncategorized on April 23, 2019 by Kristin Armitage. Have you ever asked Doug for advice on what to plant in your plots? I’d bet money I know what the first thing he’d ask you is. Not sure? Not sure how to find out? Don’t worry, we got you. Soil tests are so important to the success of your plots. They spell out for you exactly what you need to get the groceries you’re looking for. Here we’ll explain everything you need to know and do to collect a soil sample and send it in for analysis. You’ll only need to take the bucket and the soil probe/shovel when you head out to your food plot site. We suggest you take a minimum of five samples from each food plot site: one from each corner and one from the center. You will put all five of these samples into the same bucket, mix them together, and then take some of that soil to submit for your sample for that plot location. Do NOT mix samples from multiple plot sites, though. You’ll want to go about 4-6 inches into the soil to collect your samples. If you’re using a soil probe, it will likely have marks on the back side that you can use for reference. First, clear away debris from the area you’d like to collect a sample from. Then, push your soil test probe into the soil, give it a twist, and pull it back up. Finally, knock that soil out into your bucket using a stick, and move onto the next spot. Once you’ve done this five times for that plot site, you have your full soil sample for that location. Collecting one of five samples for this plot. Don’t have a soil test probe? No worries, you can accomplish the same thing with a shovel. Ideally, we suggest doing this with something like a garden trowel, but you can make it work without. Basically, you just shovel out a small hole, then scrape the edge of the hole with the shovel. Then place a length of that sample into your bucket. Repeat four more times. If you only have a shovel, shovel out a small hole and then just scrape some soil of the edge. Then put some of that soil into your bucket. Once you have all your individual samples from one food plot in your bucket, go ahead and stir it all up. You will then take a portion of this entire sample and submit it for testing. Essentially, what you’re submitting is an average for the entire plot site. Remember that this is just for one location; be sure to not combine individual samples from multiple sites. This could drastically skew your results. Ok, so now you’re ready to send in your soil sample. Remember that test kit? When you open that up, you’ll find two sheets of paper, a bag to put the soil in, and an envelope to put the sample bag and paperwork in for mailing. It’s pretty self explanatory. An account number will be listed on the form; write that number on the first line of the soil sample bag. Include your name. Be sure to come up with a name for the plot location (Bob’s plot, or Plot A, or whatever you want to call it). You’re sample ID will be 1 unless you had a 5+ acre plot that you divided into smaller sections. You’ll also notice on the information sheet there’s a section to check off what you intend to plant in that plot next. If you know, great! Mark it off and you will get specific recommendations for that seed blend in your results. If you’re not sure, just check Big Racks. For the sections “Previous Crop,” “Soil Type,” and “Tillage & Depth,” if you don’t know, it’s ok to leave them blank. That’s it! Include your $18 cash or check in the envelope with the information sheet and soil sample bag, and drop it in the mail! You can expect your results soon! We’ll explain how to read your results in an upcoming post. In the meantime, if you still have questions, leave us a comment on this post! Got more specific questions? Join us April 26 at Stadium View in Green Bay for a night of food, drinks, prizes, and food plot knowledge. Reserve your spot here. Hey, thanks for sticking around to the end! Use code HB10OFF for 10% off your next order. Happy shopping! This entry was posted in Food Plot Tips and tagged food plot, soil test, soil testing on April 22, 2019 by Kristin Armitage. When it comes to food plots, we get a lot of questions about what to do, when. And we get it! It gets confusing. There’s spring plots and there’s summer plots; there’s small kill plots and there’s big food plots. All of these need to be handled differently. And then there’s soil tests, weed control, fertilizer, what KIND of fertilizer… oof! It’s ok. We’ll walk you through a basic timeline, and then over the next few months we’ll dive deeper into some of these specific steps. Refer back to this as the year goes on to stay on track with your plotting plans. *Note* We do realize this may vary based on where you’re located. If you have specific questions, don’t be afraid to reach out. Pick new potential Food Plot/Kill Plot sites – take advantage of the snow for finding trails and bedding areas. Use that information to pick new plot sites (if you need them); keep in mind access to these locations and prevailing winds during hunting season. 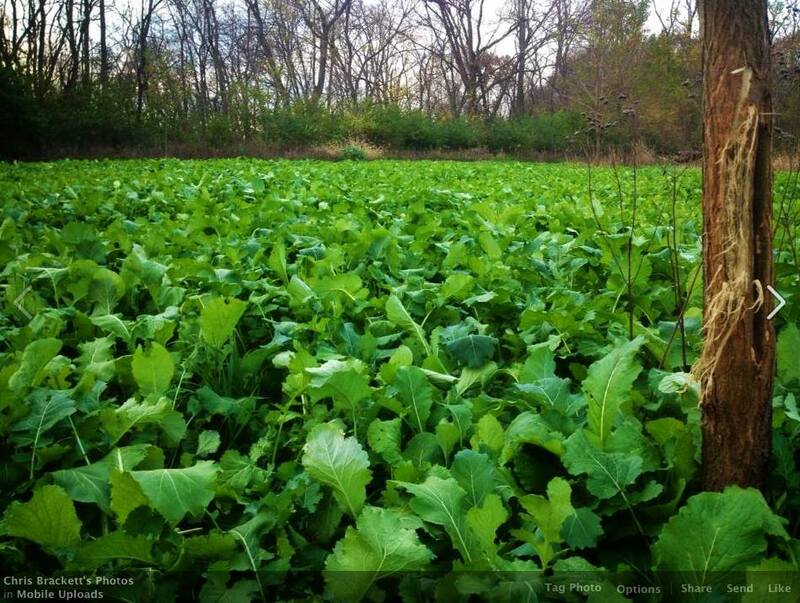 Note: when we say food plot, we’re talking a minimum of 2 acres; kill plots, under 1 acre. Soil testing – As soon as you can. Please, please do not skip soil testing! The results from your soil test are your guide to food plot success. By skipping soil testing and fertilizing according to the test’s results, you will be losing out on your food plot’s potential. Frost seeding – Wait until the snow is gone and some of the frost has come out of the ground. Seeding too early means it will sit on top of the snow or frozen ground, which means risking that most of it could become bird food. We recommend frost seeding clover such as our Luck O Blend; most of our other blends should be planted later. Soil testing – If you haven’t done it yet, May is still a good time. You can still get your results with enough time to prepare for what you may need to add to your soil. Weed control – Just because your plot looked brown and dead in April doesn’t mean the weeds aren’t there. Your seed doesn’t stand a chance if it’s going to be competing with weeds, so make sure you’re eliminating those as much as you can. Mow any clover plots – if you frost seeded clover in early spring, you’re going to want to mow that when it blossoms. Fertilize – You want to try to fertilize as close to planting as you can so the fertilizer can be used by the seed, not washed away. Plant! – Ideal timing is 60-80 days before a killing frost. Planting too early means your plots will likely be there and gone before hunting season even opens. Be patient! We promise it’s worth the wait. Of course, fertilizing and planting are not just two simple last steps and then you’re done. There’s disking, rolling, and making sure you’re not over/under seeding too. Equipment varies, as does the blend you’re planting; we’ll get into those details in another post. Fall – Shoot a Big Buck! Got more specific food plotting questions for Doug? Come to his seminar at Scheel’s in Appleton, WI on Tuesday, March 26 or see him at any of his 4 seminars at the Madison, WI Outdoor Life/Field and Stream Expo, March 29-31. See the full schedule of upcoming seminars here. This entry was posted in Food Plot Tips and tagged fertilize, food plots, mineral, schedule on March 22, 2019 by Kristin Armitage. If you missed the Wisconsin State Hunting Expo in Green Bay, don’t worry! There’s plenty of opportunities coming up to visit with the HB Seed Team or hear Doug speak on the topic of food plots. Here is the current expo and seminar schedule; we will post additional details and updates as we get them. Check back for more info, and we’ll be sure to remind you as events approach. Follow us on Facebook or Instagram to stay up to date! This entry was posted in Uncategorized and tagged Doug, food plots, seminars on March 11, 2019 by Kristin Armitage. Be sure to mark Tuesday, March 26 from 6 – 7:30 pm on your calendars! Doug will be speaking about all things food plots at Scheels in Appleton, WI. Cost is $10, and registration is required. Visit Scheels Customer Service to get signed up. All registered attendees will get a $10 Scheels gift card and are eligible to win other prizes, including seed and mineral! This entry was posted in Uncategorized and tagged Appleton WI, Doug, food plot, food plot seminar, scheels, seminar on March 5, 2019 by Kristin Armitage. If you’re new to HB Seed Co. or food plotting, thanks for checking us out! And to all our customers, thanks for your continued support! Your success is our success, and we’re looking forward to helping you make the most of the upcoming season. Whether you’ve been using HB Seed Co. products for a while or you’re visiting us for the first time, you may be wondering how a company like this came to be. The story has been told many times, in person and on podcasts, but we’ve never really explained our story here. So, if you sit back and relax, we’ll take you on a brief walk down memory lane. Doug grew up on a family farm that was established in 1917 in northeast Wisconsin – in fact, he still lives there. He’s a third-generation farmer and still raises beef cattle today. Using the knowledge from his farming background, he started planting food plots in the 80s, mostly for people who were interested in attracting deer so they could watch them in their yards. Through the years it was something Doug did on the side – that is, until life decided to throw the Kostreva’s a curve ball. Both Doug and his wife were laid off, and after some deliberation, he decided it was time to take his part-time gig and turn it into a business. Can we just mention really quickly: we do know they’re called antlers. But have you ever been driving around, spotted a big buck in a field, hit the brakes and said, “Look at the horns on that guy!”?? It can’t be just us. Even Doug’s wife says it, so you know it’s legit. In fact, she says it so much that when it came time to name this new business she said, “Why not Horny Buck Seed?” You know, after their horns. What were you thinking? You have to admit, it’s pretty clever. And so, this play on words led to the Horny Buck Seed Company (now shortened to HB Seed Co.) being born in 2012. Doug contacted his brother, a graphic designer, and after a few designs, Horny the Buck became the official mascot and logo. So, what is HB Seed Co about? For starters, as our homepage will tell you, we’re all about the freshest seed! But not only are the seed blends fresh, they include variety. Just as you wouldn’t want to eat the same thing for every meal, deer also like to mix things up — and HB Seed Co delivers with the deer groceries. The blends are all designed to be high in nutrients to help maintain a healthy herd for bucks, does, and fawns alike. Beyond the products, though, HB Seed Co. is all about helping customers succeed. We want to provide you with the know-how to plant and grow healthy plots that keep the deer coming back for more. When customers connect on the deer of a lifetime – whether it’s their first, biggest, or somewhere in between – thanks to their HB Seed food plots, that is the ultimate reward. You don’t need to be a third-generation farmer like Doug to plant healthy food plots. Our goal is to provide you with the information and support you need to attract deer, maintain a healthy deer herd, and see that sweat-equity pay off! We love helping people, so we hope to provide more content in the future to assist you in as many ways as we can – and we hope to keep having fun doing it! Check back frequently for more tips and updates. If you missed us at the Wisconsin State Hunting Expo in Green Bay, don’t worry! There will be plenty of chances to meet and learn from the HB Seed team in person coming up. More details soon! In the meantime, be sure to keep up with us on Facebook. This entry was posted in Uncategorized and tagged dougkostreva, foodplots, hbseedco on February 26, 2019 by Kristin Armitage. This entry was posted in Uncategorized on March 19, 2018 by Packerland. This entry was posted in Uncategorized on March 7, 2018 by Angela Franzen. This entry was posted in Uncategorized on February 21, 2018 by Angela Franzen. This entry was posted in Uncategorized on February 18, 2018 by Angela Franzen.